Belarusian enterprises have supplied important units and parts for the Russian defense industry since Soviet times. They continue to do this now. There is no longer an alternative to the multi-axle wheeled chassis of the Minsk Wheel Tractor Plant (MZKT): it is difficult to find any other vehicles of the kind and type of Russian army troops wherever they are used. First of all, the strategic missile complexes Topol, Topol-M, Yars and the new complex Rubezh, which will be put into service. On the chassis of the MZKT, the famous Iskander, S-300 and S-400 surface-to-air missile systems, Bastion and Bal space defense complexes, as well as wheeled versions of the Tor and Buk SAM systems. Single-axle tractors MAZ-529 were widely used in the Strategic Missile Forces of the USSR. They were used as lifting and positioning units 8U210, 8U224, 8U224P, 8U224M, tractors for 7-ton starting unit 8U217, cranes 8T25 and 8T26 (load capacity of 10 tonnes) for ballistic missiles R-9, R-12, P-14, P-16 and P-36. The Engineers Forces MAZ-529 was used as a part of self-propelled scrapers, rollers, loading platforms for installation of different equipment. The Soviet army noticed the efforts at MAZ and ordered a cross-country truck for themselves. So they made first biaxial truck – MAZ-535. It was full-wheel-driver, kind of 8×8 drive and was planned to be used as an artillery tractor. Later it was converted to transport the first Soviet rockets. MAZ-535 was a very advanced machine. A lot of elements previously not used in Russia were installed there: semi-automatic transmission, hydromechanical transmission as well, wheel pumping on the go system and more. Again it had very high off-road capabilities, could pass streams and small rivers up to 1.3 meter deep or move on the 30 degree slope. Also was very durable. MAZ-535A tractors from the late 1950s were used for towing 152 mm M-47 cannons and special transport carts with ballistic missiles R-5M, R-12 (8K63), R-14 (8K65), R-16 (8K64), R-26, R-36 (8K67), GR-1 (8K713), and RT-15. In 1958, for the transport of R-12 missiles (launch weight 42 tons), a 8T115 truck with single-axle front axle wheels and two-pitched rear wheels (size 22 850 × 2720 × 2500 mm) was created. Later, for a rocket R-16 (launch weight 150 tons), a two-axle truck 8T139 was developed. On this trolley on the next parade in Moscow on May 9, 1965 MAZ-535A towed the experimental rocket GR-1 (launch weight 117 tons). For the installation of missile launchers on the basis of MAZ-535A, an experimenal chassis MAZ-535B was created. In 1959, an experimental launch vehicle D-110K of the Onega tactical complex with a 3M1 missile (starting weight up to 3 tons) was installed at the Ural Machine-Building Plant at MAZ-535B, which was tested in 1960. On February 5, 1960 the development of the complex was stopped by PSM No. 138-48. In April 1961, tests began of the tactical complex "Ladoga" with a 3M2 missile (launch weight 3150 kg). Three launches in July-September 1961 resulted in the destruction of the missile in the active section of the trajectory due to structural defects. Early in 1962, a batch of advanced missiles was being prepared, but on March 3, 1962, work on this system was stopped by PSM No. 213-113. MAZ-535V was a semi tractor version of MAZ 535A with a permissible load on a 5th wheel of 12 tonnes. It featured a boogie suspension of both rear axles without elastic element, more durable tires. It also had no a winch and tire inflation system. Its curb weight was 18.9 tonnes. Mass production started in 1959 at the Minsk Automobile Plant, and later it was moved to KZKT. It become the most popular version of all the 535th range. Usually MAZ-535V were used in a combintaion with a two-axle low-bed semi-trailer MAZ-5248. Since 1961, it applied for delivery of a long-distance tracked launcher 2P16 SAM 2K6 "Luna" based on a PT-76 amphibious tank, and then towed low-bed semi-trailers MAZ-9989. The MAZ-535B chassis proved too weak to be used as a launcher. Instead of these missile systems in 1961, the "Luna" complex with various types of missiles was adopted. Ironically, the crawler chassis of the 2P16 launcher, created on the basis of the floating tank PT-76, had a small resource and for the transportation of the complex a special semi-trailer was used, which was towed by the truck tractor MAZ-535V. In accordance with PSM No. 839-379 of July 21, 1959, NII-1 (the future Moscow Institute of Heat Engineering) began designing the first Soviet solid- propelled 9M71 tactical missile "Temp" with a range of 600 km and a combat power [ie, explosive yield] of 300 kt. Launching 9P11 (Br-225) was proposed to be placed on the basis of MAZ-535V in a coupling with a semitrailer MAZ-5248 with a payload of 25 tons (according to other data, based on MAZ-537B). The development of the Br-225 launcher began on February 14, 1959 at the Barrikady plant. In June 1956, work was completed on the first two prototypes, which for the next two years undergo intensive tests in the most difficult road conditions. At the same time, a truck tractor was built on the basis of MAZ-535, which received the MAZ-537 index, intended for towing heavy semitrailers for tanks. Both versions are first manufactured at the MAZ facilities, and then their production is transferred to the then secreted Kurgan Automobile Plant, which annually built 150-200 MAZ-535 and MAZ-537. Structurally, both machines have much in common, primarily in layout and critical technical solutions. They were equipped with a 12-cylinder diesel engine D-12A, which develops 375 hp. at 1650 rpm or 525 hp. at 2100 rpm, which is realized behind a roomy and comfortable four-seater cabin. MAZ-537 tractor with a payload on a fifth wheel of 25 tonnes was designed to work in a combination with a GCVW of up to 90 tonnes for delivery of tracked vehicles, oversized cargos, heavy weapons and missile systems. The development process started in 1956 in parallel with works on MAZ-535 and MAZ-536 tractors. The first prototypes were made at the end of 1958, then in March 1959 a small-scale production began. In 1964 the production was transferred to KZKT plant. MAZ-537 was adopted by 30 July 1962 and still is a part of the Russian Army. From a technical point of view, MAZ-537 was similar to MAZ-535 with an enlarged by 300 mm wheelbase. It was equipped with a diesel engine D12A-525 V12 rated at 525 hp. The MAZ 537D was developed in 1959 to work as part of various missile systems. It had a 25-tonnes fifth wheel, and was additionally equipped with an AC generator station. Its was produced by KZKT since 1964. With the rise of ballistic rockets Soviet Army was in need of a transport that could carry them. They came up with a new MAZ truck – MAZ-543 8×8 truck. already in the late 1950s, apart from powerful tractors capable of carrying multi-ton rockets, a need arose for large self-propelled wheeled chassis designed for missile launchers. Such chassis were created in the SKB ZIL, and Shaposhnik received a task to develop a larger chassis. He arrived at the ZIL, where together with the chief designer of the ZBL ZIL, VA Grachev, analyzed possible solutions. The analysis showed that the variants of the arrangements "the nose of the rocket over the cabin" (as in the ZIL-135E and ZIL-135LM) and the "rocket behind the cab" (as in the ZIL-135K) do not pass: the new missile was too long. As a result, the layout of the chassis with a cab divided into two parts was proposed, between which was the bow of the rocket. Thus, the length of the chassis along with the launcher was almost equal to the length of the rocket. The overall height also dropped sharply. This chassis was almost completely unified with the chassis of the MAZ-537 truck tractor, differing from it with a cabin divided into two doubles, with seats "one by one" and a wheelbase increased to 7.7 m. MAZ-543 has turned out to be a powerful, mobile, compact (overall dimensions 11,7x3,0x3,0 m), which has a high cross-country capability, suitable for operation at temperatures from -40 to +50 . Since March 1959, the Minsk Automobile Plant started its own production of wheeled tractors, and the machines of the 543 series have become the main product of this division. They were equipped with V12 engines with 38.8 liter engines which gave out 525 horsepower. The first truck was made in 1962 but it was only 1965 when they showed it at Red Square parade. The new machines first became the basis on which the equipment for the launchers of the 8K14 missiles was mounted, since the caterpillar chassis, which was originally used for this missile, did not ensure a smooth course along the rough terrain. And as a chassis for various types of missiles, it had 2 double booths for combat crews, between which the head of the rocket was located. Technical solutions embodied in all-terrain vehicle models "535", were so successful, that they were further developed in the family "543". MAZ-543 received an independent torsion suspension of all wheels with telescopic shock absorbers, a system of centralized tire inflation, and the wheelbase increased to 7700 mm, and the track became 2375 mm. Neither on the axial load on the roadway nor on the width they did not comply with the norms for public roads. But in the swamp, sand and deep snow came with a rather high average speed, which, in fact, was required from mobile launchers. High traction qualities and patency made the MAZ-543 desirable not only for the military, but also for the builders. 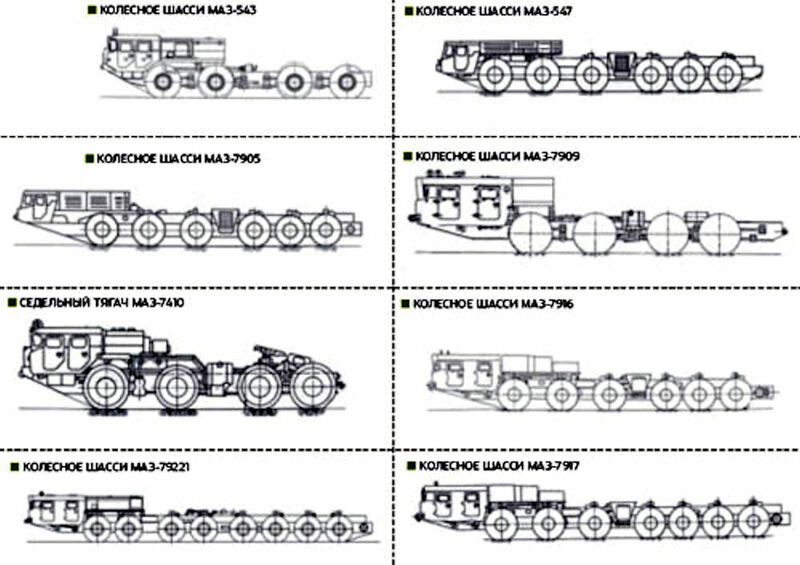 The civil modification MAZ-543 with the onboard cargo platform received the MAZ-7310 index, the MAZ-7901 pipeline, the MAZ-7510 truck, and the MAZ-73132 truck tractor. MAZ 543M is the most famous military chassis. The first prototype MAZ 543V was made in 1972, mass production started four years later in 1976. The new version was unified with other versions 543 and 543A, but was fitted with a single cabin shifted to the left. Early chassis had headlights fitted in the front bumper. Later version got headlights integrated in the front mask. The only design feature of MAZ 543M was two 370 liters fuel tanks additionally equipped with centrifugal pumping pumps. Payload is increased to 22.2 tonnes. Crub weight - 21.1 tonnes, GVW - 43.5 tonnes. Other technical data was similar to MAZ 543/543A. A flatbed version joined the lineup in 1978. More then 4500 copies were made till 2000s. Since 1986, 543M produces in China under Wanshan brand. MAZ 543M used as a chassis for a missle comples 9K58, missle launcher "Rubezh-A", coastal artillery complex "Coast", mobile missle comples "Temp 2S", "Pioneer", "Topol" and "Topol-M". As the size of the rockets and their range was growing, the need for larger trucks was emerging. The development of missiles was irreversible, so by the mid-1970s, longer mobile chassis were required for mobile launchers. So first six-axial 6×6 full wheel driver MAZ-547 appeared. Then there were 10 and 12 wheeled vehicles MAZ-547, which did not require significant design changes, since the designers of Shaposhnik initially laid the modular construction principle in them. All this made it possible to obtain a 14-wheeled modification of the MAZ-547A chassis with two cabs and six pairs of driving wheels, which was intended for transportation of the RSD-20 transport and launch complex. It was made to carry “Temp” and “Pioneer” Soviet rockets. It was in production from 1970 till 1984. It also had a V12 engine, however it was less volume – “just” 25 liter big, but now already had 650 horse power. It had fully automatic transmission and tires that could change its pressure. Thanks to this the huge machine could move in the conditions no kind of road despite its 27 ton weight and 16 meter long. It could carry 62 ton payload and move up to 40km/h. The SS-20 Saber missile used a MAZ-547A/MAZ-7916 transporter erector launcher produced in the Belarusian SSR by the Minsk Automobile Plant. The fuel economy for those trucks was crazy: 260 liters per 100km or 0.9 mpg. The crew of the vehicle consisted of two people seated in two separate cabins. Driver was in the left, rocket launch crew chief in the right. The 55-tonnes MAZ 547V was developed and produced in parallel with the MAZ 547A. Its main purpose is to be a hauler of special equipment of the new missile complex 'Pioneer'. The first two prototypes were made in 1974. The design of the chassis of 547A and 547V was the same, but the second one got a new appearance. The cabin on the right side was shifted back and installed 500 mm higher. It has new design with triangle shaped roof, two small side windows and a ventilation hatch on the front. MAZ 547V got updated engine injection system and electric equipment. Compares to the 547A, width was reduced by 40 mm (from 3200 to 3160 mm), height was increased to 2840 mm. Fuel tanks capacity — 880 liters, range — 500 km. 538 copies were made till 1984. In response to the American small-size intercontinental missile "Midgetman" at the Moscow Institute of Heat Engineering, the ICBM "Courier" was developed, the draft design of which was ready by 1984. The transporter for this missile, named MAZ-7909, was designed without any problems. In December 1987, the first prototype of this all-wheel-drive four-axle chassis was manufactured in experimental shop No. 2, which was intended not only for the launcher, but also for the transport-reloading unit and the combat vehicle accompanying the complex. The following year, another three MAZ-7909 (8 x 8) cars were launched. This chassis had a diesel engine with a gas turbine supercharged YaMZ-8424.10 with a capacity of 470 hp, a mechanical nine-speed gearbox YaMZ-202, wide-profile tires of the model VI-203 (1500x600-635), a lifting capacity of 27500 kg and its own curb weight of 19500 kg with the following overall dimensions : length - 12967 mm, width - 3200 mm, height - 2930 mm. But as the weight of the missile "Courier" as a result was more than calculated, then the designers had to urgently develop a new, five-axle chassis MAZ-7929 (10 x 8) with the same engine and gearbox. The carrying capacity of the chassis has grown to 35,000 kg with a curb weight of 25,000 kg and dimensions: 15180 mm x 3400 mm x 3462 mm. In 1989, released four machines of this type. From March 1989 to May 1990, the PGRK Courier successfully passed the tests in Plesetsk, but at the stage of putting it into service, as in the case of the PGRK Speed, the work on it was discontinued. Domestic politicians once again interfered in the matter. Of the more recent developments of OGK-2, the MAZ-7917 chassis with a wheel formula of 14x12, equipped with a 710-strong diesel, deserves special attention, the giant develops a speed of up to 40 km / h. It is intended for a mobile complex equipped with intercontinental ballistic missiles "Topol". The MAZ-7912 / MAZ-7917 is a Soviet and Russian army 14x12 transporter-erector-launcher designed and developed by the Minsk Automobile Plant. The eight-wheeled all-wheel drive chassis MAZ-79221 is intended for placing the product, systems and special equipment of the self-contained launcher of the Topol-M missile system, its transport-unloading unit and their transportation on the roads of I-IV classes. The intercontinental ballistic missile Topol-M, designed to replace standing Topol missiles after completion of the established operational lifetime, and for an adequate response to the US Star Wars program, has been developed for both silo and mobile ground-based missiles. The MAZ-79221 chassis was designed to become the mobile base of this missile complex, which has no analogs in the world. The 7-axle MAZ 7917 was a base chassis for the missile complex 'Topol'. Its predecessor the model 7912 as well as the 547V had one important disadvantage — lack of space for all crew members. This problem was solved after presenting the 6-axle MAZ 7916 with 2 long cabins. Actually, MAZ 7917 is the 7-axle version of MAZ 7916. Development started in 1982, the first prototype appeared in 1984. The next year mass production was started. MAZ 7917 replaced the 7912. The left fiberglass cabin has 2-doors and 2 seats (for the driver and crew commander), the right one — single-place for the operator of the missile complex. Comparing to MAZ 7916, curb weight was increased by 1 tonne (to 32.5 tonnes), overall length — by 1.5 meters (to 18,710 mm), turning radius was 27 meters. Working speed — 18-32 kph. The chassis got 2 fuel tanks with a capacity 395 and 450 liters. Range — 413 km. Fuel consumption — 265-365 liters/100 km. It was fitted with a multi-fuel engine V-58-7 V12 (38.9 liters, 710-720 hp) made by CHTZ. 402 copies of MAZ 7917 were made till 1992. Then rockets became even more bigger and Soviet engineers from MAZ factory came out with their super-giant – MAZ-7904. It was supposed to be used for intercontinential ballistic missiles. During the Cold War it was moved out of the hangar for testing only when they were sure there were no American satelites above. For many years it was considered to be lost, but recently one working specimen was found near the Baikonur space launching site in Kazakhstan. This thing was huge - 32m (100 feet) long, 6.8m (20 feet) wide, could carry 200 ton missiles and had actually two engines. One was a 1,500 horse power ship engine and another was a regular 330 hp truck engine. Maximum speed of this monster was just 27 km/h. MAZ 7904 was an offroad 6-axle twin-engine chassis with two 2-seat cabins and 12 huge wheels with diameter of 2.8 meters [9.1 feet]. Its payload is really incredible — 220 tonnes. The only purpose is installing the parts of the first missile complex 'Celina'. The main engine was a turbocharged marine diesel 12CHN18/20 (M-351) V12 with a capacity of 42.4 liters and output of 1500 hp located in the front between the cabins. It was connected to the two hydromanual 4-speed gearboxes. Wheel configuration is 12x12. The 1st, 2nd, 5th and 6th axles were driveable. Each wheel has its own hydroair suspension. MAZ 7904 uses 51 inch tires made by Bridgestone. The second auxiliary engine YAMZ-238F V8 was used to power hydro pumps, electric generators, vents of the cooling system and other units. Its output is 330 hp. Curb weight of the chassis is 140 tonnes, GVW — 360 tonnes. Overall dimensions — 32200x6800x3450 mm. Track — 5.4 meters. Ground clearance — 480 mm. Turning radius — 50 meters. The only prototype of MAZ 7904 was collected in June 1983. The tests took place only in the dark time and according to a schedule when the enemy satellites did not “hang” over this territory of the USSR. After 547 km the prototype was dismantled and loaded onto a special 12-axle 120-ton trailer platform to ship to Kazakhstan. The second stage of tests tool place there when MAZ 7904 passed 4100 km with a maximum speed of 27 kph. In 1985-87 Minsk engineers came out with a real life truck “centipede”. The twelve axial MAZ-7907 was made to carry Soviet “Tselina” SS-24 ICBM missiles. Only two of those were ever built. It was probably the only full-driver 12×12 truck in the world. The truck measured 28.1 meters [some reports state 30 meters] long, 4.80 meters width, 4.50 m height and has a ground clearance of 2 meters. It was powered by helicopter-like gas-turbine engine which gave 1250 hp. Then all this horse power was converted into electricity with 24 electric motors, each of them spinning its own wheel. This MAZ-7907 with the wheel formula 24x24. On the experimental chassis, which, if not for conversion, could serve as the basis for a new missile system, a gas turbine with a capacity of 1200 hp was installed. Experiments with gas turbines have been carried out since 1966. In particular, in 1977 it was manned in the experimental order of MAZ-543P. Power plant MAZ-7907 drives an alternator, which, in turn, energizes the electric motors mounted in the wheel hubs. Its twelve axle chassis has huge dimensions: length - 30 m, width - 4.8 m, height - 4.5 m. The main technical features of this monster include the use as a power plant of a gas turbine engine (a specially designed and manufactured version of the GTE tank engine -1250 - GTD-1250A) with a capacity of 1250 hp. and rather complicated, but effective electric transmission with 24 motor-wheels. The articulated frame and a large stroke of the wheel suspension with a diameter of almost two meters provide the machine with a design combat weight of 200 tons good cross-country ability on the dirt roads of a complex profile and a maximum speed of up to 40 km / h.
MAZ-7906 is an eight-axle special chassis, which was developed (as well as MAZ-7907) for the mobile intercontinental intercontinental missile system "Celina-2". In contrast to the MAZ-7907, the MAZ-7906 was a diesel engine.